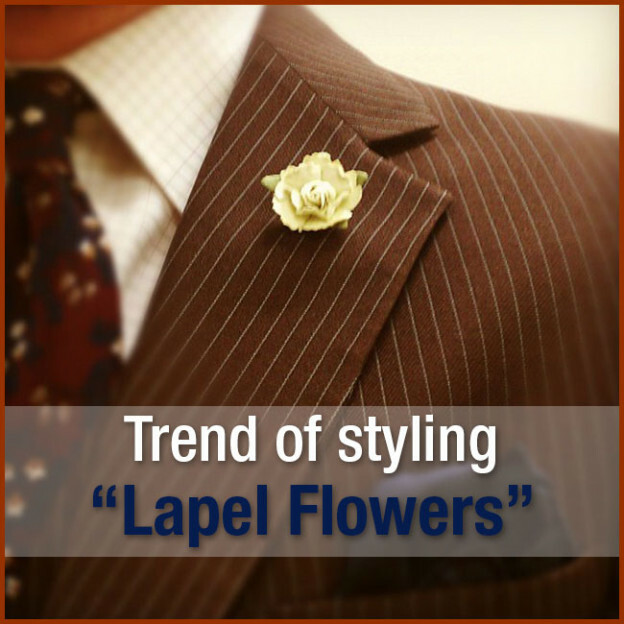 In the current fashion scenario trend of styling ‘lapel flowers’ has become a style statement. They are unique in their own way; make you stand different, while giving an elegant finishing to your outfit. You can even go for a traditional or a real flower, but a fabric flower will not only stay longer, it will also act as a conversation starter. You can easily make them from any fabric, in any pattern or color you want. The most commonly used are the white carnation, the gardenia, the blue cornflower and the red carnation. Other flowers can be miniature roses, lily, delphinium, and white azalea. Install the chosen flower into the jacket and leave it until it gets adjusted. It is always the right occasion to rock a “Lapel Flower”: mostly, men accept wearing this piece during black or white collar events, like proms, opening night or weddings. Although, there is no right or wrong time to pull of this versatile piece. In fact, it is popular for both casual and formal attire. Lapel flowers act as an addition to your suit thus giving you an elegant look. From date night to office, don't be shy to show-off your lapel flower. Time to spruce your outfit: button pins and lapel flowers are a minor accessory, but when worn they bring wonders to your outfit. But, make sure you choose wisely, all you need to do is focus on one main rule – less is more. Express yourself: lapel flowers come in many colors, patterns, sizes, prints and shapes – they tend to make every outfit look different. As a personal advice, you can add additions like a pocket square! You don't need to be embarrassed for wearing label flower. It's a minor detail that will make you notice without making too much of a fashion statement. On That Note: There's no such reason to save this accessory for special occasions or events. However, you can make every outfit an outstanding ensemble with just a few fashion tricks. Good Luck with that!